The history of the Parish church of St Michael the Archangel was originally written by the Rev. 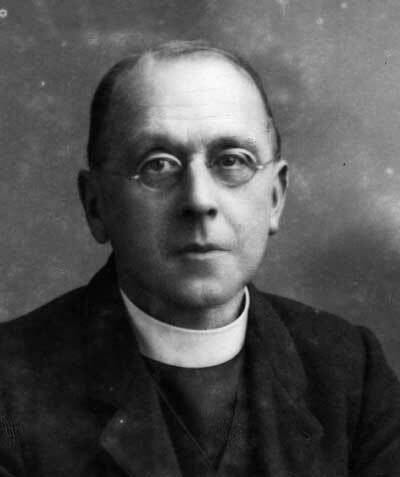 WRN Baron in 1923, drawing heavily on the earlier publication North Craven Churches by Canon WA Shuffrey. It proved a popular little guide and it was updated by him for a 2nd edition in 1926 and which is reproduced below. When the guide finally ran out of print it was replaced by a series of brief church history leaflets based on the Rev. Baron's text, but in 1989 the Church Council issued a facsimile, third edition, to commemorate the 500th Anniversary of the rebuilding of the church. In 2004 it was decided that after 80 years of service it was long due another revision and a new guide was published in 2005. This is well illustrated with numerous old photographs dating back to 1870 and much new information. Copies are available from the Webmaster using the PayPal secure payment system at £5 incl. UK postage. The profits from this publication go directly toward the upkeep of the church. The unexpected demand for this little book has tempted me to issue a second edition. It has given me the opportunity of making a few corrections and additions. I have favour to ask : should any reader be able to throw further light on the meaning of "Reb" which follows the Cromwell signatures, the S. Syth-Zeta-Osyth problem, or the use to which "2 gallons of wine bought for the Easter festival" were put, I should be grateful if he would communicate with me. Strangers approaching Kirkby Malham for the first time must feel some sense of surprise as they emerge from the tunnel of trees down Holgate Head, unconscious perhaps of the nearness of human habitation until they have almost tumbled into the village. This sense of surprise is increased when they see the grest church in the background. The purpose of this little book is to tell in as few words as possible the story of "the ivied wall where the church-bell rings," commemorated by Charles Kingsley, who stayed with the late Walter Morrison at Malham Tarn, and left his impressions of our countryside in "Water Babies." It need hardly be said that without the information already published by Dr Whitaker and Canon Shuffrey, much as follows here would have remained unrecorded. Feast of St Michael 1923. It is reasonable to suppose from the name of the village—Kirk-by—that the Danes found a little moorland church here when they made their way from the coast to the rich limestone pastures of Craven. If that be so the foundation cannot be later than the IXth century and may date from the missionary journeys of S. Oswald, King of Northumbria and S. Aidan, his Bishop, in the VIIth century. In spite of Guide Books and the Ordnance Survey, the church is dedicated to S. Michael the Archangel. The earliest evidence on this point is the reference in Archbishop Gifford's register to the institution in 1275, of William de Billingford to the "Church of S. Michael of Kirkeby-in-Malgdale," while a host of wills of XV, XVI and X VIIth centuries are quite unanimous on the point. 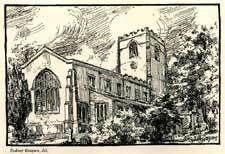 By the year 1199, the church had been handed over by Adam, son of Adam de Giggleswick, to the Abbot and Canons of the Abbey of Our Lady at West Dereham (Norfolk), Kirkby being at that time one of the Manors in his possession. A glance at the list of Vicars, given on pages 22 and 23, will show that with three exceptions all the pre-Reformation Vicars were of East Anglian birth. The last of the long line is of special interest: John Downham was instituted in 1509, and lived on in charge of the parish after the dissolution of his old Abbey, until 1550. This is one of the numerous instances on record of a Vicar remaining in office through the crisis of Henry VIII's reign into the troubled times of Edward VI. Thus he saw the introduction of the English Language into some of the church services, and it is just possible that a copy of Edward VI. 's first Prayer Book of 1549, may have reached him before his death in the following year. The Study of a church should always begin with a walk round the outside to discover how far the general plan has been modified in later times. The abrupt change from battlements to a plain parapet, which coincides with the Chantry of the Rood and Lady Chapel on the south and the Chantry of St. John Baptist on the north (see Ground Plan), suggests that the church was completed on a larger scale than originally intended. Near the top of the south-east buttress of the tower is carved the coat of arms of Fountains Abbey (Azure, three horse-shoes Or) which held much of the land in the parish from Malham northward, Bolton Priory holding land east of the River Aire in the townships of Malham East and Calton, and West Dereham Abbey accumulating a large area on the West. In Domesday Book (1080-86), no mention is made of a church here, the whole district being described as waste. The inference is that when the Conqueror ravaged the North of England, the church fell a victim to the flames which destroyed the village and was in ruins when the survey was made. That it was soon afterwards patched up in a rough and ready way seems more than likely from the fact that King John confirmed the gift of Adam de Giggleswick referred to above. Early in the XVth century however, a great change took place. Either the dilapidated condition of the fabric made the rebuilding of the church imperative or the Vicar of the period felt it a duty to provide the parish with a place of worship more worthy and dignified ; in either case it was completely rebuilt on a noble scale with a detail in mouldings which reveals Norfolk influence, and Malhamdale is fortunate in having inherited a church which has stood untouched for five hundred years. i. For Malham of Calton: Gules, three chevronels braced in base Argent: on a chief Or a lion passant Azure. ii. For Tempest of Bracewell : Argent, a bend between six martlets Sable. iii. [Unknown] : cheeky, on a chief three annulets (tinctures not marked). iv. For Bank of Bank Newton : Sable, a, cross Or between four fleurs de lis Argent. These families were doubtless large benefactors to the church at the time of rebuilding. The niche over the entrance is wide in proportion to its height, suggesting that it once held a figure of the Patron Saint slaying the dragon. The porch contains nothing of special interest beyond two consecration crosses on the jamb of the doorway. A modern casing tends to draw away attention from the door, but the inside view reveals its antiquity, and shows what is perhaps the socket for the sanctuary knocker. It does not require much imagination to make us feel how beneficial an institution sanctuary was especially in so isolated a district, when police were as yet unknown and men too often took the law into their own hands. The deep cavity in the thickness of the wall, at the right hand on entering, held the oak beam which was used for barring the door. When archaeologists hesitate to suggest dates it would be rash even to hazard an opinion as to which century the font belongs. 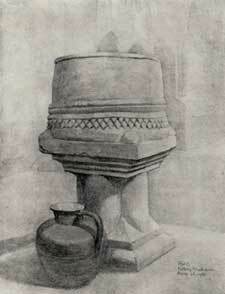 The crudeness of design and workmanship are sufficient evidence of a venerable antiquity. If local tales are to be believed its history is as chequered as it is long. That it was discarded in XVIIth century is certain, for its supplanter can be seen out-side near the porch. Story goes that it was used for a pig-trough : another, that it was used for slacking lime. 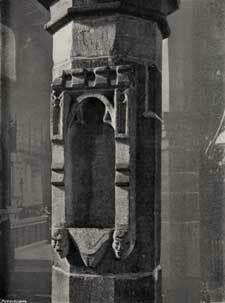 Meanwhile its base had disappeared, but the font itself was rescued and restored to its sacred purpose in 1881. The muniment chest, which may be said to have been built rather than made, is considered to be XIVth century. In the pavement are set three stone coffin covers of XIIIth century, which were removed in 1881 to their present position from the nave, where two of them marked the burial places of Vicars of the Parish : one showing the chalice in relief, and an earlier one having the chalice and service book incised. The small oval panel of coloured glass—a reverent representation of the Virgin and Holy Child—is late XVIth or early XVIIth century work from the continent. Immediately below it is a charming cross of XIIIth century lately removed from the front of the porch where it had been used as a building stone. i. Tenor (25 cwts. ), 1601 : the gift of Josias Lambert of Calton, inscribed "God bless our Church, our Queen and Realm." ii. Recast in 1785 : Inscription, "Soli Deo Gloria." iii. 1617. Inscription, "God be our speed both now and ever." In addition to the fact that the floor slopes down, towards the East, a peculiarity which seems to be original, the church has the unusual feature of being enriched by a series of niches on the pillars. Reference to the ground plan will show that the body of the church was almost equally divided into Nave and Choir; so that the niches were in full view of the congregation. The churches at Bracewell and Broughton are similarly adorned ; it is therefore likely that the Tempest family had some influence in determining the design when the church here was rebuilt. Prior to the wholesale destruction of ornaments in Edward VI's reign the nave must have presented a noble appearance when the Rood still reminded worshippers of what it cost to redeem the world, when the roof timbers were picked out in colours, traces of which are still evident, and each of the seven niches suggested the virtues of Saints. Up to the present the names of only five of these are known :- Our Lord, Our Lady, S. Syth, S. Nicholas, and S. Sonday (S. Dominic). One in the N. aisle is surmounted by the crown and sacred monogram, and therefore needs no explanation. In Vicar Dytton's Compotus, to which reference will be made later, we read that in the year 1454 offerings found in the box of S. Mary amounted to 6d., and offerings in S. Syth's box, 4/2. Incidentally the disparity between the sums collected suggests that the East Anglian Vicar could not resist the temptation of giving such prominence to his own local Saint that the people neglected the Blessed Virgin. This is not the place to deal with the problem whether S. Syth is S. Osyth or S. Zita of Lucca. That S. Zita holds the field in the majority of cases cannot be doubted. But the close connection between this parish and East Anglia leads to the hope that some day evidence will be forthcoming which will justify the theory that Vicar Dytton was referring to S. Osyth. The niche of S. Nicholas can be easily identified at the entrance to the chantry of the Rood (see floor plan). The commissioners of Edward VI in making their report on the Kirkby Chantries recommend "that the chantry of the Rood at Kirkby Malhamdale, with the Grammar School there, be continued." There can be no doubt that S. Nicholas (Santa Claus) as Patron Saint of children occupied the niche in this chantry, the side panels of which rest upon two children's heads. Thus children on entering the chantry to do their lessons would pass the figure of the Saint who presided over their studies. The very minute T cross at the foot is probably a reminder of S. Nicholas' pilgrimage to Jerusalem, to pay reverence to the True Cross discovered by S. Helena. The arched piscina in the south wall marks the position of the chantry referred to above. On the pillar opposite is a shield bearing a crude representation of the emblems of the Passion. The recess in the wall seems different in character from the niches. The chiselling is left rough, and holes drilled into the surrounding masonry as if to hold iron bars or hinges, point to its having served some other purpose. Eastward of the chantry was the Lady Chapel, now used as the organ chamber. The entrance has been built up but the piscina is still intact; while in the pavement behind the organ two fragments of the altar may be seen, showing three of the five consecration crosses. 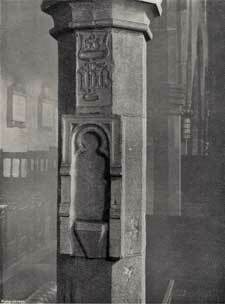 It seems that this Lady Chapel was in some way connected with Bolton Priory, and at the dissolution of Religious Houses it passed, along with the Bolton Priory estates at Malham and Calton, into the hands of the Lambert family, by whom it was dismantled and converted into the family pew. The small brass (1676) and the large tablet (1701) commemorate the last two members in the male line of this once prominent family. It is a matter for regret that we have no memorial to Major-General John Lambert, who having served with distinction in Cromwell's army, was exiled at the Restoration, but allowed to end his days at Plymouth, where his remains lie. Dr Whitaker, antiquary and historian, says in a neat phrase, "The mind of Lambert was a machine, wasted first by friction and then by rust." Thanks to the care of the late Mr Walter Morrison, the church was restored in 1881, but in so conservative a spirit that almost everything that could be retained of original work was preserved. With the exception of a few timbers the whole of the main roof remains as it was 500 years ago. The central beam is ornamented with a carved mask. The face is said on good authority to have been copied from the later issue of King Henry IV's coinage. The mouth is open : the dimple of the chin is pierced. Within is a grooved wheel or pulley. It is not easy to say definitely to what use it was put : but the most likely suggestion is that by it was drawn up the Rood Cloth which veiled the figures during the Lenten season. That a Rood did exist is proved by the will of Ralph Buke, 1541, who requests "that my bodie be buried in the Churche of Sancte Michaell Tharchangell of Malloughdale in the midway allie afore the Roode." It is perhaps hardly necessary to draw attention to the oak pews, yet a few moments spent in studying them in detail will disclose just those subtle little variations which reveal the individuality of the men who erected them : here a plain chamfer, there a moulding, in one a carved panel, in another an initial and date. 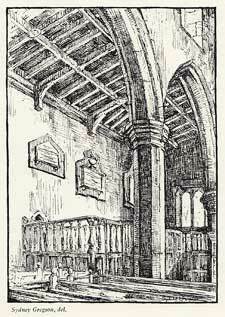 One man apparently broke up an oak kist wherewith to make his pew, while the man who founded the old Malham School (Rowland Brayshaw), inlaid his pew with ebony and box-wood. Above the N. arcading is a coat of arms : quarterly, Argent three calves passant Sable, for Metcalfe, of Beare Park and Nappa in Wensleydale; and Argent a lion rampant Gules, for Hertlington. Thomas Metcalfe, who fought for Richard III., at Bosworth Field, married Elizabeth Hertlington and thereby became Lord of the Manor of Hanlith. The small panels of coloured glass are good examples of continental work of XVIth century. The one in the north window will be recognised as Albrecht Durer's Shepherds at the Bethlehem Manger, the fourth of the series known as "die Kleine Passion" : in the south window is a richly coloured figure of S. Ann holding the Infant Baptist and the Infant Christ. In the top corners are charming little representations of the Annunciation and the well-known incident of S. Augustine of Hippo being rebuked by the child. These panels, together with the Madonna and Child in the Baptistry, are recent gifts to the church. The panelling which surrounds the sanctuary was erected in 1923 in memory of the late Walter Morrison. His timely help in 1881 probably saved the church from ruin. "Lector, si monumentum requiris, circumspice" might well be inscribed upon its walls in his honour; but future generations will now be reminded of the debt they, as we, owe to one who added liberality to love. The lettering of the memorial panel on the north is copied from the Elizabethan choir stalls in the Hospital of S. Cross, Winchester: the following is a free translation. The walls of this sanctuary, restored by him when in a ruinous condition, have been panelled in affectionate memory of Walter Morrison, of Malham Tarn, Master of Arts and Doctor of Civil Law of Oxford, a man of the greatest generosity of heart and hand. He represented in Parliament for 24 years the borough of Plymouth, and the Skipton Division of Yorkshire. He was educated at Eton and Baliol, where he took honours. He afterwards showed himself a keen supporter of learning. 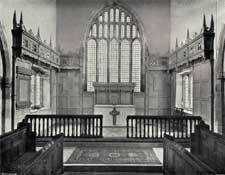 He presented a splendid chapel to Giggleswick School. In the University of Oxford beside other benefactions he added munificently to the endowment of the Bodleian Library. After having been resident in this parish for 64 years, he deceased on December 18th, 1921, in the 85th year of his age, deeply lamented by many friends, dependents and neighbours. The coats of arms in the canopy sum up the long history of the Church and Parish. In the case of Percy the original coat - five fusils in fesse - is represented in preference to the Lion rampant, assumed by Agnes de Percy on her marriage in XIIth century with Josceline de Lovaine, son of Godfrey, Duke of Brabant: similarly the original device of Lambert has been preferred to the elaborate coat which dates from the more prosperous period of the family history when they invented the pedigree, claiming descent from William the Conqueror. l. CLIFFORD. The Manors within the parish were held partly under Percy and partly under Clifford. 3. ALCOCK. Successors in title to the manors of Calton, Airton and Hanlith from Lambert of Calton. 4. LISTER. The Manors of Malham East, Malham West, and Kirkby Malham passed indirectly to Lord Ribblesdale from Lambert. 5. BOLTON PRIORY. Held lands in the parish east of the River Aire. 6. FITZ HUGH. Lord of Airton. 7. FOUNTAINS ABBEY. Held lands chiefly in the northern part of the parish. 8. PROVINCE OF YORK. The parish from the time of its foundation lay in the Diocese of York till 1836 when it was transferred to the newly formed Diocese of Ripon. 10. WEST DEREHAM ABBEY. At the end of the XIIth century' Adam de Giggleswick, handed over the church to W. Dereham : the Abbot becoming thereby Rector and Patron: and canons (Premonstratensian) from the Abbey were sent here as vicars. 11. MORRISON. The panelling is erected to the memory of the late Walter Morrison, Patron and Benefactor to the church. 12. LAMBERT. Lord of the six manors of the Dale named above, after the dissolution of the Religious Houses. 13. METCALFE. Lords of Hanlith through marriage with the heiress of Hertlington. 14. SERJEANTSON. Chief Landowners in Hanlith for many generations. 15. MALHAM. Chief landowners in early times in Malham and from the XIII cent. in Calton. 16. KING. Owners of land in Scosthorpe and Kirkby : Thomas King, in 1622, built the house which is now the Vicarage; he was ancestor of Captain James King, navigating officer under Captain Cook. It is unnecessary to describe the memorial. It is the gift of Mr H. C. Moffat, of Hamptworth Lodge, Salisbury, a nephew of Mr Morrison; the designs are by Mr E. Guy Dawber; the bearings on the shields are from the brush of Mr George Kruger Gray; it was made by Messrs. Rattee and Kett, of Cambridge, from English oak, by a band of old-fashioned craftsmen : praise to them all! The same architect designed and the same craftsmen executed, the Altar Cross. The cross itself with the crown of thorns encircling the sacred monogram symbolises the Passion: the rays of light breaking out from the crown of thorns symbolise the Glory of the Resurrection, and the crowns at the extremities symbolise the Royalty of the Ascended Christ. The church possesses a remarkably beautiful white altar frontal of silk damask upon which is appliqué an elaborate cross of Venetian work, probably not later than XVIIth century. Chantry of John the Baptist. Half the N. aisle was occupied by the chantry of S. John Baptist, founded by Sir John Tempest, to commemorate his father, Sir Piers Tempest. He followed Henry V, in 1414, to the French wars but did not return, the presumption being that he fell at Agincourt. It will be noticed that the original intention was to decorate the bosses in the roof with conventional designs: but in one or two cases the work was left unfinished. Mention must be made of the more elaborate pews which half-fill the chantry. They are good examples of Jacobean design and workmanship. The east window of the chantry (S. Columba copying Finian's Psalter, S. Columba arriving an exile at lona, S. Columba blessing his missionaries) is the work of Mr Alex Strachan of Edinburgh for the Serjeantsons of Hanlith (1354-1919). It is the first of a series of five memorial windows, which, when complete, will tell of the great figures in English church history who founded and established Christianity in the North. The second, representing S. Oswald and S. Aidan is the gift of the Kings of Skellands. It has been executed by Mr Archibald Nicholson to whom has been entrusted the task of designing the remainder of the series. In the vestry is preserved a fragment of another pre-Reformation Altar, showing four of the five crosses which symbolise the five wounds of Christ. The Parish Registers, which date from the reign of Queen Elizabeth, are on the whole in good condition. Of special interest are two signatures of Oliver Cromwell. There has been some diversity of opinion as to their genuineness, but evidence is accumulating which tends to show that they are the Protector's own handwriting. If he and the other magistrates signed the marriage entries as witnesses, then one at least of Cromwell's must be a forgery, for it is known that he was in London on the day when the marriage was solemnised. But by the statute of 1653, every parish was ordered to appoint a "Register" who was responsible for issuing certificates of banns and for keeping a "true and just account .... of publications of all such marriages . . and a book of good vellum or parchment shall be provided by every parish for. the registering of all such marriages . . . and the Register in such parish shall attend the .... Justice of Peace to subscribe the entry." The probability is that the Register took the book to Calton Hall on hearing that Cromwell was with Lambert, to be subscribed according to statute. If that be so, then the actual date of the marriage itself has no bearing on the subject. Since in XVIIth century there was probably no magistrate resident in Craven between Skipton and Sedbergh, and sessions were held only at irregular intervals, it was imperative that the Register should seize the first opportunity of getting his book "subscribed" by any magistrate who might happen to be in the neighbourhood. It may be added that he would be a singularly bold man who attempted to forge the signature of Cromwell, when a personal friend like Lambert, who would be quick to detect the fraud, lived in the parish, and the fact must not be overlooked that one of the highest authorities in England to whom the register has been submitted has pronounced the ink of the signature to be contemporary. to Richard Walker, dog whipper. 1734 pd. for sending Redgchester and parchment. 1788 Allowances to ch. wardens for making bargins. To Daniel Brayshay for 12 gallons of wine. Mrs. Williams for 4 Sacrament dinners and the 5th of Novm. An entry undated, but earlier than 1803, reads : "A list of the subscribers in the parish of Kirkby, Malham Dale in Craven, Yorkshire, towards the exigences of the state "; and "Names of subscribers to the Volunteers in the Craven Legion, 1803": these carry us back to the Napoleonic Wars. Several pages are devoted to "Briefs" e.g. "April 26th, 1807, Northwood Fire Com. Southampton, 4s.10 1/2d." "July 7th, 1809, Pudsey Mill fire in the Com. York, 7s. 3 1/2d." " Oct. 29, l8l0, Swaffam St. Cyraic and do. St. Mary Com. Cambridge, 2s. 6d." "1813. Dawlish inundation in the Com. of Devon, 2s. 10d." The most interesting of the communion vessels is a chalice made at York, by Sem Casson, in 1632, given to the church by James Ward of Ravenflat, whose pew stands in the chantry of S. John Baptist. Those who like to dip into the past should glance at the framed photograph of John Dytton's compotus, the original of which is in the British Museum. Written in 1454/55 it gives in full detail the sources of income of the benefice and the items of expenditure. The compotus is addressed to the Abbot of West Dereham, Rector and Patron: it throws considerable light on social conditions in England in XVth century and the purchasing power of money. Thus under the heading of mortuaries, a horse is valued at 26/8, a mare and foal 8/-, a cow 7/- : under "Tithes" we learn the following values :- a lamb 8d., a calf 2/2, " 31/2 little pigs " 16d., a goose 2d., a cockerel 1/2d., a stone of wool 1/6. The rent of a toft with 21/2 acres of land 6/8, rent of a cottage 6d. per annum. Altogether he accounts for £73 13s. 8d. received, but the first item of expenditure shows that Vicar Dytton can hardly be said to have lived in luxury, for he " asks permission to deduct the sum of £5 13s. 4d. for his own annual stipend." Among other payments are: 12/- for Peter Pence, a fine of 12d. for not attending the Manor Court of Lord Fitz Hugh, at Airton: 22d. for shoeing a horse sent to the Lord Abbot, 10/- for two journeys to Norfolk. Repairs to the church property cost £10 l2s. l0d. : under which heading is included the sum of 32d. for repairing the Barn at Malham, which had been damaged during the winter by rooks and jackdaws. This led to a lawsuit with Thomas Malgham, the tenant, owing to his refusal to bear the cost of the repairs. The expenses of the lawsuit amounted to over £14. In describing the repairs to property Dytton intersperses his Latin with an odd collection of English words—wattlyng, thakke, wallyng, wrytnot, basyng, crokke. The daily wages of a carpenter varies from 4d to 5d. A little human touch is added by the entry "for drinks given to the carpenter." One item which might be looked for, but in vain, is relief of the poor: it is therefore obvious that a large proportion of the income went out of the parish to support a monastery 200 miles away. Froude is not exaggerating when he writes :- "I do not doubt that for many centuries these (religious) houses fulfilled honestly the intentions with which they were established: but as early as the reign of Richard II it was found necessary to provide some other means for the support of the aged and impotent : the monasteries not only having then begun to neglect their duty, but by the appropriation of benefices having actually deprived the parislies of their local and independent means of charity." The paragraph 'Church Expenses' is not without interest. "Also for 500 wafers and 2 gallons of wine bought for the Easter Festival, ijs. jd. Also for wafers and wine bought for the church for the whole year, xxijd. Also for 8 lb. wax bought for the church for the whole year ivs. ivd. Also for Holy Oil and chrism ivd. Also for oil for the lamp in the choir vjd. ob. Also for Incense ijd. Also for rushes for the church at the Great Festivals ixd." It raises the question - was the Cup withheld from the laity here in 1454 ? if so, why " 2 gallons of wine " ? This then is the story of an English Village Church: every stone of it interesting. But those who visit it will feel that its greatest charm is not the harmony of its architecture, nor the historic associations with which it abounds, but the sense of God's Presence which it inspires. It is this that impresses itself upon those who enter it. Requiem ceternam dona cis, Domine : et lux perpetua luceat eis.
" Our Ladye Preste "
Wm. Russell Needham Baron, M.A. Remember that this guide was written in 1923 and does contains some inaccuracies addressed by the new guide published in 2005. In addition the new publication contains numerous old photographs of the church, vicars and parishioners, some dating back to 1870, as well as much new or updated information. All profits from this publication go directly toward the upkeep of the church, not this website.